Our Mokolo is a large, open platform that children love. They can lie on it, rock it from side-to-side, jump off it into the water, SUP it, paddle it and invite 10 friends to join them on it. 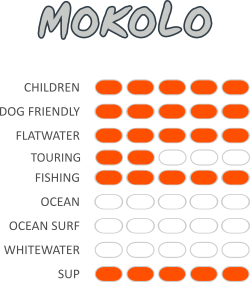 Like Huckleberry Finn, children will enjoy spending hours out on the Mokolo. This is the most dog-friendly kayak around, especially as your canine companion does not have to be confined to a tankwell. Your dog can comfortably sit or lie-down on the deck, which is covered in cushioned foam pads. These also ensure that their paws won’t slip when they move around on the deck. With a Mokolo, you can enjoy water-based activities with Fido and Spot. Mokolo is most at home on flatwater where it can be paddled from a seated position or from standing. Although it has not been designed for speed, Mokolo does move at a fair pace. As maximum carrying capacity is 200kg, two adults can paddle together with more than enough space for gear too. 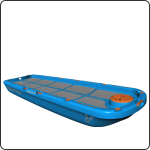 As the Mokolo is not a fast boat, you won’t complete a journey in record time, but you will be able to pack enough gear and food to survive the duration. Mokolo’s twin hull is broad and has been designed for stand-up stability. With its open platform, no longer will a day of kayak fishing be spent sitting on your bottom. Stand-up, cast, stretch your legs and paddle from one prime fish-catching spot to another without sitting. Of course, you can paddle from a seated position too. This large deck, with its aluminium deck rails, is your customisable ‘blank canvas’. Arrange and attach crates, tackle boxes, rod holders and devices – like GPS units and fish finders – to the deck. There is enough space to take a friend along with you. Mokolo is brilliant on flatwater but lacks sea legs. It may look like a board, but we don’t recommend taking Mokolo into the surf. You’re sure to get dunked. Rather take one of our whitewater kayaks down rivers and save Mokolo for tame waters. More stable than a yoga SUP, Mokolo is a versatile craft for Stand-up Paddling (SUP). While you’re unlikely to win a SUP race on the Mokolo, it is super stable and is a pleasure to SUP.